Come and join us on Friday the 5th of June for the opening of Tomorrow Never Knows at Arti where Frank Koolen & Kasper Jacobs present the next step in their ongoing project Play Curacao. A performance takes place from 20.00 - 20.30 hrs during the opening of the exhibition. In the summer of 2014, Kasper Jacobs & Frank Koolen went to Curaçao for a residency at Instituto Buena Bista.In the three months of their stay, they looked at specific forms of leisure on the island. In a direct and dynamic but also uncanny way, they documented their findings in the film 'Play Curaçao'. 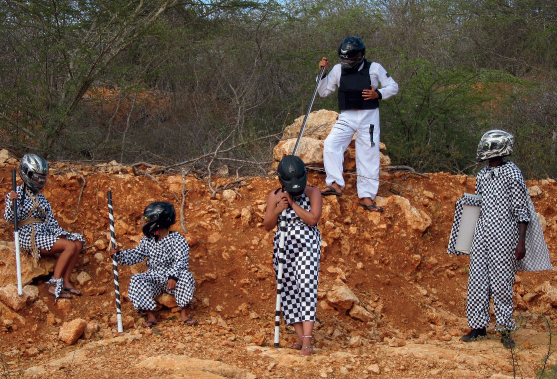 As part of the exhibition in Arti they decided to shine a light on the special meeting with the local Curacao subculture 'The Band of Recent Future', from a historic, contemporary and futuristic perspective.